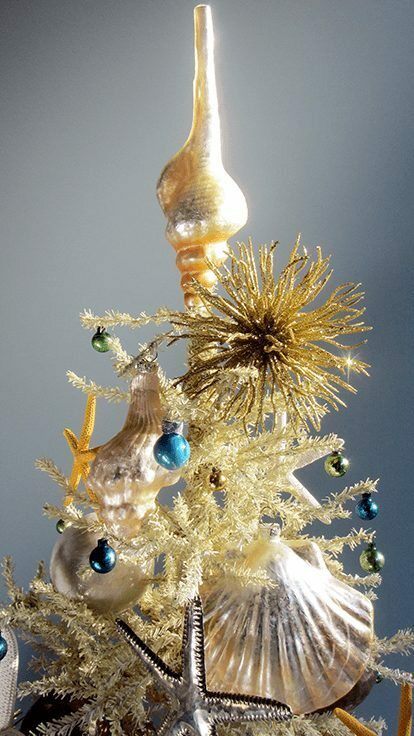 Tree decorator Darryl Moland creates the most marvellous mini trees for Christmas as well as for other holidays and occasions, and I found two Christmas trees that are inspired by the beach. 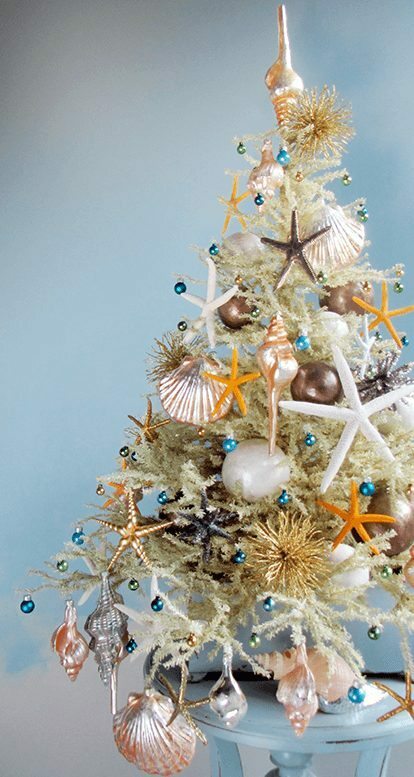 Capturing the feeling of summers by the beach, this Mini Beach Christmas Tree combines an assemblage of mercury glass shell ornaments, starfish ornaments of all shapes, colors and kinds, glittered sea creatures, and others. Some of the mercury glass shell ornaments are from Homegoods. They sparkle like the water! Two glittered starfish are from Martha Stewart and the five conical gold shell star porcelaine ornament (on the left) is by Margaret Furlong Designs. 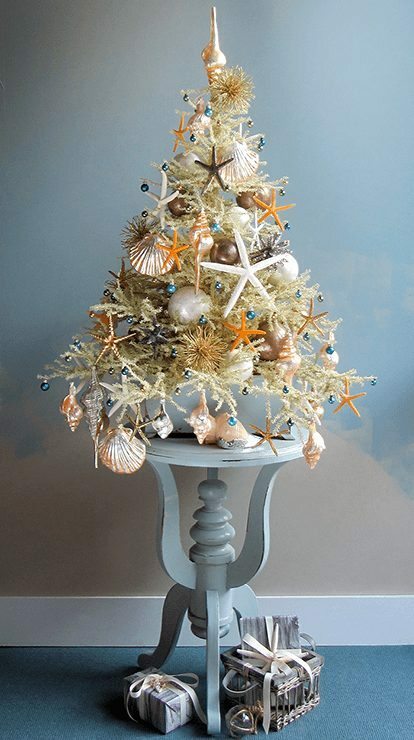 Darryl carefully gathered the elements for this mini beach Christmas tree over several months. This pressed tin star, for example, is a symbol of his last trip to the beach in Tulum, Mexico. He bought the star at Atlanta’s High Museum. 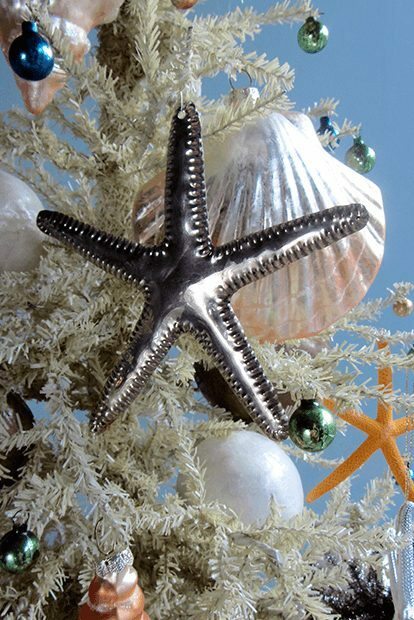 To produce a unique tree topper, Darryl simply removed the cap from one of the mercury glass shell ornaments and turned it upside down. 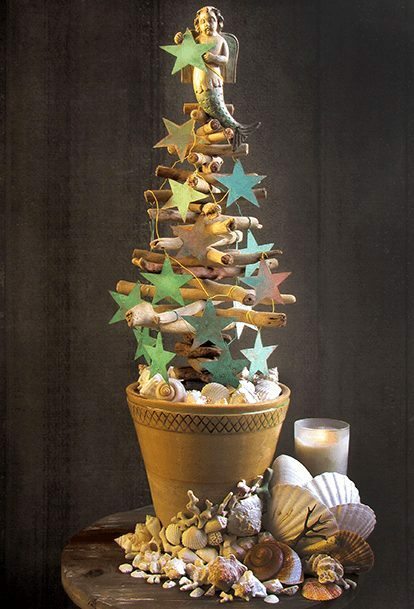 Darryl’s Mini Driftwood Christmas Tree has an under the stars theme, capturing the gazing upward at a starry sky from an unencumbered beach unspoiled by the lights of civilization. It brings one’s destiny into focus, he says. Many of the shells encroaching the container of the tree were found on the beach at Tulum. 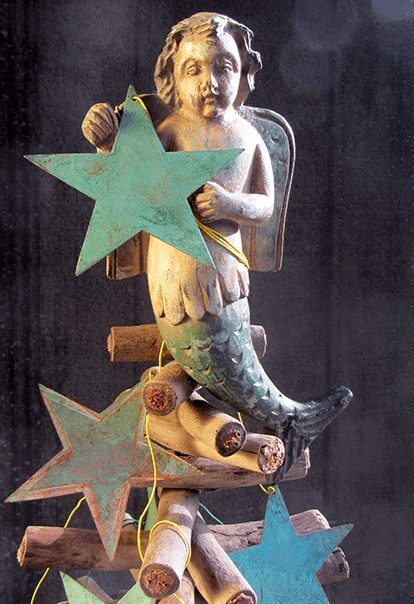 An unusual winged mermaid finds a symbolic home atop the Christmas tree. With her fish tail and wings, she embodies the link between the earth and the sky, creating a perfect visual metaphor for the connection Darryl felt on a night on the beach under the stars. There is so much heart and soul in Darryl Moland’s mini Christmas trees. It’s contagious! A recipe for life really, to create things that have personal meaning, in a mindful step by step kind of way, not rushing it. Visit Darryl Moland over at his blog The Decorated Tree where you also find the link to his book of the same name. 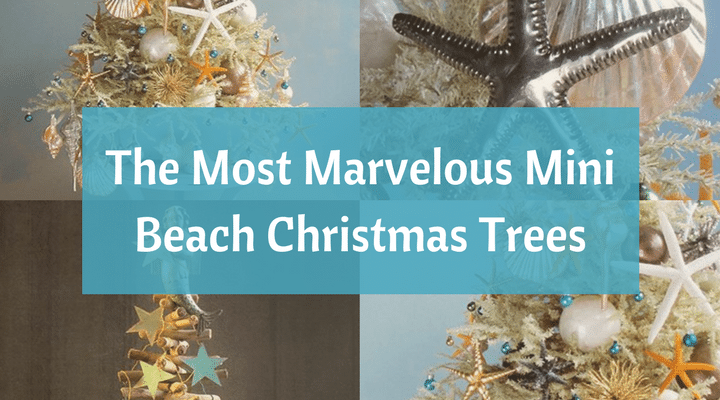 And of course, click on the tree links to learn more about each of the mini beach Christmas trees. Thanks for writing about my trees! And thanks for the link to my blog! Much appreciated! Next time, contact me in advance and I can work with you on getting original content that might not be on my blog!